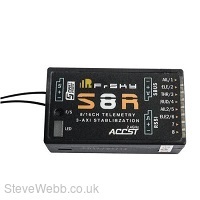 The S8R is a FrSky X-series receiver with built in 3-axis stabilization. For conventional Fixed Wing and Glider Models it will support stabilization, automatic level, hover and Knife-edge flight modes, for Delta Wings or flying wings and V-tail models it supports stabilization and automatic level flight modes. You can edit the type of model and manipulate all these features via the S8R.Config or S8R.lua. 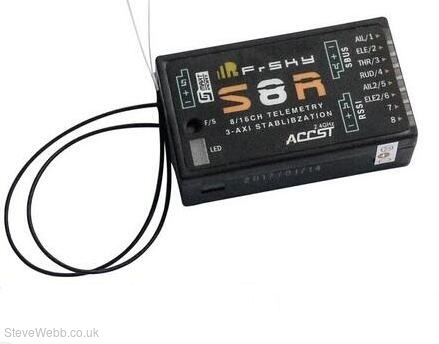 The S8R can also be used as a standard 8 channel X series receiver if it is required.